This post was written by Syracuse London student Meredith Vondran, reflecting on her trip to the Warner Brothers Studio Tour London on “The Making of Harry Potter”. Meredith wrote this post as part of our London Passport program, earning an “Art, Architecture & Heritage” passport stamp to recognise her cultural engagement. All study abroad students are granted passports at the beginning of the semester to record their development as global citizens. I still remember the Christmas where I opened a DVD box set containing the first three Harry Potter movies. At the time, I hadn’t heard of J.K. Rowling’s 7 novel series about the boy who lived, but I eagerly took my seat on our checkered couch to watch all three movies back to back. 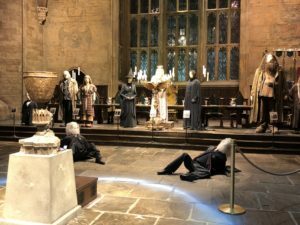 The excitement that I felt that Christmas, being absorbed into a new fantasy world filled with wizards and magic, returned as I stepped inside the Great Hall at the Harry Potter Studio in Leavesden, United Kingdom. The stone flooring was created just for the film, as were the fireplaces and walls, yet the magical ceiling and floating candles are pure postproduction movie magic. Real candles were used initially, until the flames burned through the wire with which they were suspended, causing them to fall onto the tables below. Many of the magical aspects of the films were created with computer technology and animatronics, like the moving paintings and the character of Dobby. 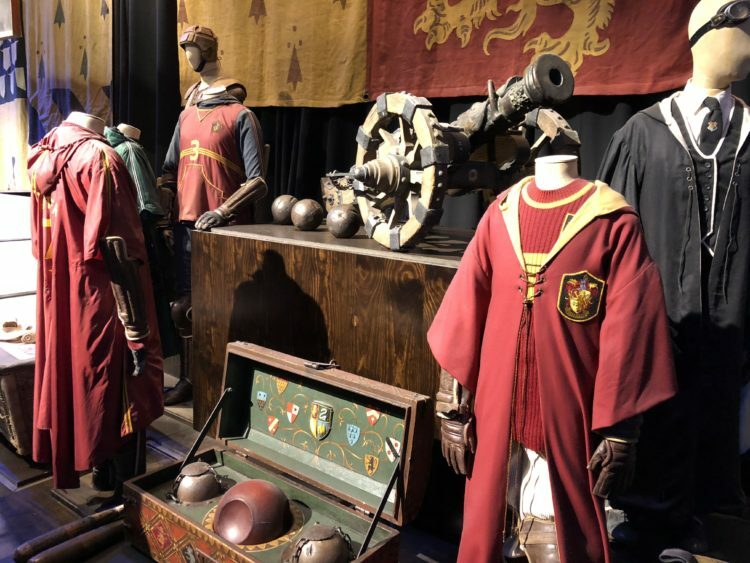 However, a lot of costumes, props and entire rooms were created just for the films like the House robes for Hogwarts students and Dumbledore’s Office. More often than not, physical sets were combined with computer-generated imagery to create the magical world of Harry Potter. As with most major motion pictures, the films’ success relied heavily on the large production staff that designed and created the sets, the props, and the costumes. There were large teams of staff for everything from animal training to set construction, including 20 makeup artists for a cast of over 800. Production staff would often step in as extras for scenes featuring the Ministry of Magic and some of those in higher positions would be memorialized in a painting used on set. All of the paintings used on the set were created just for the films. 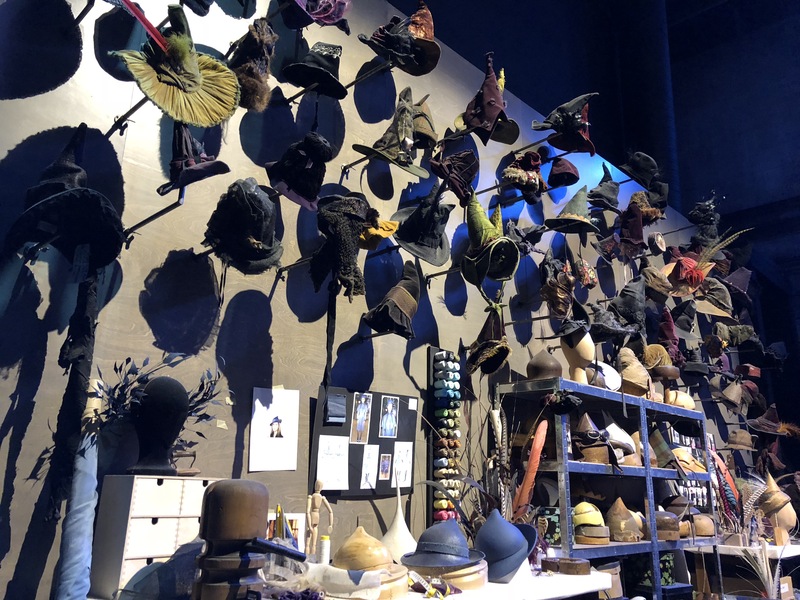 There were also thousands of costumes made including hundreds of hats and 300 customized wands. Through the Harry Potter Studio Tour, a large part of pop culture from my childhood came to life. Watching the world of the films become reality and seeing the scale of production and intricacy of the sets, props and costumes has made me appreciate the film series even more than I had prior. Weeks were spent building the Dursley residence in its entirety and a room-sized replica of Hogwarts castle to use in filming flyover scenes. I’d always loved Harry Potter because the wizard world always felt so real, and now I know what was done to achieve that authenticity.